'Black Panther' Brings New Visibility To Cosplayers Of Color Cosplay, when people wear costumes to play fictional characters from comics, often excludes people of color because most comic book characters are white. The film Black Panther is changing that. 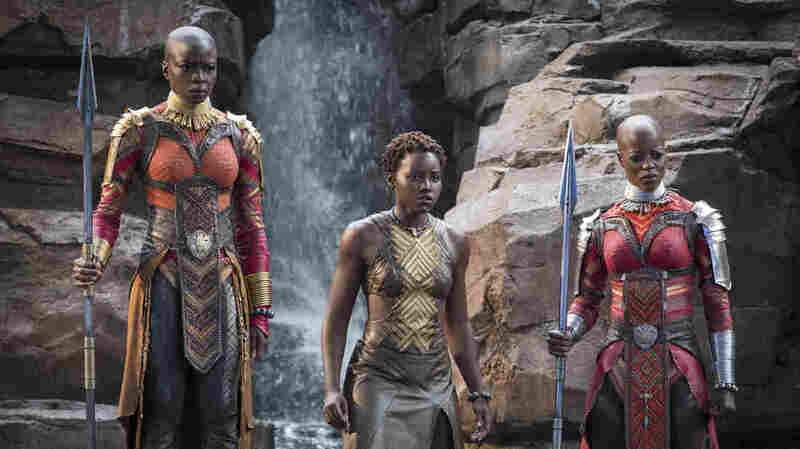 Danai Gurira, Lupita Nyong'o and Florence Kasumba are pictured in a scene from the film, Black Panther. Gurira says the representation of women in Black Panther is important for young girls to see. But Black Panther, which features a black lead and a predominantly black cast, offers a multifaceted depiction of African life where people of color play both the villains and the heroes. These characters are transforming the playing field for non-white cosplayers like Tamara Heredia, a black cosplayer from Houston, Texas. "Black Panther, the movie itself, was such a big deal for me simply because I had never seen powerful black women portrayed like anywhere really," she tells Here & Now's Robin Young. "So to see them be like the head, the leaders, of Wakanda was really really powerful for me." Others say that Black Panther is helping create a more inclusive world both within the cosplay community and outside of it. "We're helping people see us as heroes," Portia Lewis, an African-American cosplayer who lives in Los Angeles, told The New York Times. "And I think black cosplayers are changing cosplay because we are now opening up a conversation about inclusion. We're a subculture within a subculture, and we're hoping the nerd community can be more inclusive toward us." Black cosplayers often face criticism and ridicule for portraying white characters. But if they want to participate in cosplay, they don't have much of a choice. An annual report on Hollywood diversity found that while people of color make up nearly 40 percent of the U.S. population, they are grossly underrepresented across the industry. "I have cosplayed non-black characters and heard the ridicule like, 'Oh well, you're black Power Girl.' No, I'm just Power Girl," Heredia says. "Or, 'Oh you're a black Wonder Woman.' No, just Wonder Woman." This sentiment of isolation among many non-white cosplayers is further felt online when they interact with the thousands of cosplayers who are overwhelmingly white, Heredia says. 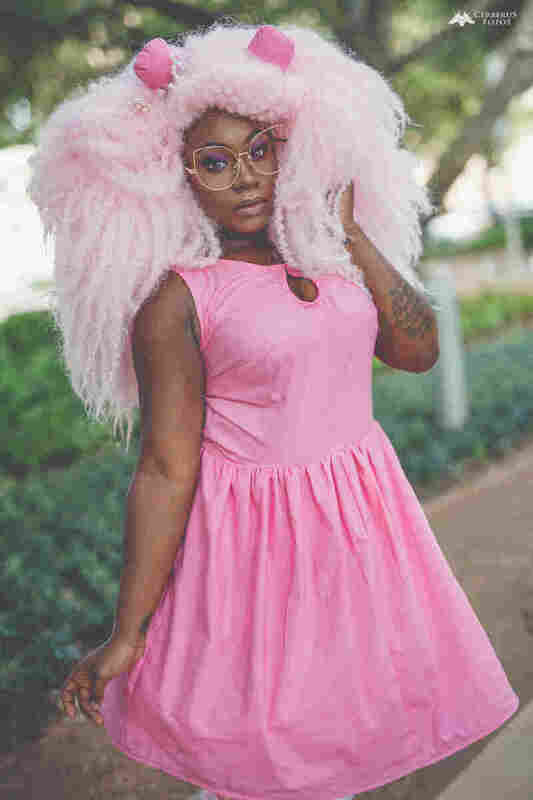 "I don't know how many times we'll go into a thread and be like, 'Hey, I'm really looking for ideas on what I should cosplay,' and it's nothing but only black characters because it's what we look like," she says. "The goal, many cosplayers interviewed said, is to disrupt popular ideas of what cosplay can and should look like and to help create a more racially tolerant environment through cosplay, both in Black Panther costumes and outside of them." Journalist Jesse J. Holland, who wrote the accompanying novel Who Is The Black Panther?, told Here & Now's Lisa Mullins last month that the movie represents the larger trend of Hollywood trying to diversify, which as evidenced by black cosplayers, is permeating into other parts of the entertainment industry. "I think not only are they going to be entertainment on the screens," he says, "but they'll also be used as icons, as symbols of the way this country is diversifying, and about how we see ourselves as a country."